Over the weekend, an image popped up on the internet displaying a what could be a logo of a new Mortal Kombat title for the PlayStation Vita, called Mortal Kombat Vitality. We know that NetherRealm Studios was among the first developers to get a “PSP2” dev kit, which was reported on when they spoke of the PSP successor’s power back in September of last year. That would give them ample time to produce a title for early 2012. The Urn of Vitality is a powerful formula in a small gold chalice that can restore one’s vitality and health to a full 100%. It was featured in Mortal Kombat Mythologies: Sub-Zero as a way to revitalize one’s healthbar. The elder Sub-Zero used this potion to replenish his health on his quest to retrieve the forbidden Amulet of Shinnok. 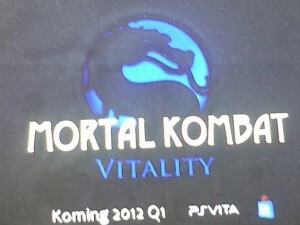 If there is a PlayStation Vita Mortal Kombat by the name of Vitality, we’d be willing to be it has something to do with Mythologies. But that’s only if it’s indeed real. Someone could have known these same MK facts, and came up with a concept that makes sense in the MK universe. Only time will tell. We’ll be sure to keep you updated if anything else is discovered.